I could use Linux/bash that’s built into Windows 10 for years now. As you may know, Windows 10 can run many Linuxes out of the box. If I have a Linux distro configured, I can call Linux commands locally from CMD or PowerShell. For example, here you see I have three Linuxes and one is the default. I can call “wsl” and any command line is passed in. So theoretically I could “wsl ssh” and use that Linux’s ssh, but again, requires setup and it’s a little silly. Windows 10 now supports OpenSSL already! You’ll get all the standard OpenSSH stuff that one would want. Level set – What are we doing and what are we trying to accomplish? I want to be able to type “ssh [email protected]” from my Windows machine and automatically be logged in. Tell the Linux machine (by transferring it over) about the public piece of my key and add it to a specific user’s allowed_keys. Here’s what I did. Note you can do this is several ways. You can gen the key on the Linux side and scp it over, you can use a custom key and give it a filename, you can use a password as you like. Just get the essence right. Below, note that when the command line is C: I’m on Windows and when it’s $ I’m on the remote Linux machine/Raspberry Pi. I ssh’ed over to Linux and note I’m prompted for a password, as expected. 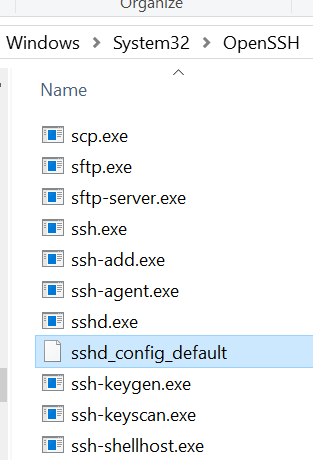 I “ls” to see that I have a .ssh/ folder. Cool. You can see authorized_keys is in there, you may or may no have this file or folder. Make the ~/.ssh folder if you don’t. Exit out. I’m in Windows now. Look closely here. I’m “scott” on Windows so my public key is in c:usersscott.sshid_rsa.pub. Yours could be in a file you named earlier, be conscious. I’m type’ing (cat on Linux is type on Windows) that text file out and piping it into SSH where I login that remote machine with the user pi and I then cat (on the Linux side now) and append >> that text to the .ssh/authorized_keys folder. The ~ folder is implied but could be added if you like. Now when I ssh [email protected] I should NOT be prompted for a password. Your identification has been saved in C:Usersscott/.ssh/id_rsa. Your public key has been saved in C:Usersscott/.ssh/id_rsa.pub. Fab. At this point I could go BACK to my Windows’ Visual Studio Code launch.json and simplify it to NOT use Plink/Putty and just use ssh and the ssh key management that’s included with Windows. NOTE: In my previous blog post some folks noted I am logging in as “root.” That’s an artifact of the way that .NET Core is accessing the GPIO pins. That won’t be like that forever.